Several articles, written by experienced specialists, are reviewed here. All the articles are about automated software tests. How AutoClickExtreme can be used for Regression automated software testing. This new version allows to copy, paste separate actions, to change the Replay Branch number. Most testing tools in the Internet market are awfully complicated! You read long sophisticated tutorials, but the more you read the more your thoughts get into a mess. You need several days or even weeks to learn how to use the tool. It seems, you would do the testing manually much faster! If you are tired of testing software manually or with complicated testing tools, AutoClickExtreme is the tool you need! It will record your actions automatically and then reproduce any number of tests at random or in the exact order you define. You just click on the Rec button and perform your manual test, when you've carried out all the needed actions, stop the record by clicking on the blinking icon in the Tray. Your automated software test is ready! You can leave AutoClickExtreme working alone for the whole night and get the results in the morning. AutoClickExtreme is a unique software testing tool compared to other testing programs. It's a smart human-like mechanism, that provides 100% control of images and never reproduces actions in a wrong window. At the same time it's a no-code easy-to-use program, no additional skills are required! AutoClickExtreme will record all your manual tests automatically. Just click on the Record button and carefully carry out your testing actions. Surely, there are some things you should know before Record, such as: press NumLock twice, and the record will stop for a while. At this point you can create Pixel Control, if you want AutoClickExtreme to look for the given image during Replay. 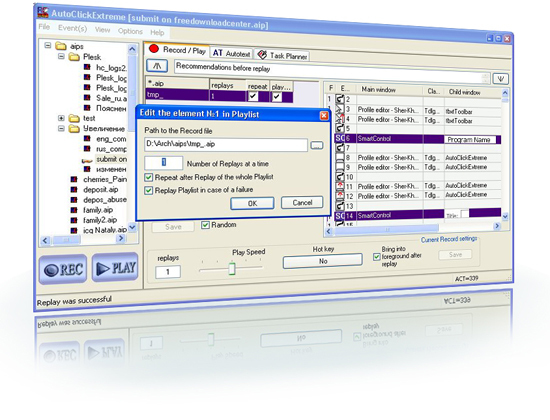 The Playlist function is specially designed for Functional and Regression automated software tests. AutoClickExtreme can perform a series of automated tests at random or in the order you choose in the Playlist. New Pixel Control technology with Replay branches is designed for GUI automated testing. AutoClickExtreme waits for the image you need to appear on the screen, then it performs all the test actions with each image it finds. If AutoClickExtreme doesn't find the image or finds some other image, it will suggest creating an alternative Replay Branch. Thus, you can create lots of Replay Branches and bind a separate sequence of actions to each image. You can create lots of alternative images, in case the interface changes. So, you wouldn't have to re-record the whole test, only create an alternative image. You can test Windows applications (Windows 2000/XP/Vista) as well as web applications and web sites with AutoClickExtreme. AutoClickExtreme is highly reliable. It will never perform actions in a wrong window (it controls windows in focus according to more than 10 parameters). You shouldn't worry if windows or buttons change their position on the screen - AutoClickExtreme will find them without mistakes! If you use different testing tools one for each testing phase, AutoClickExtreme will easily integrate all the tools you use into one *.aip file. It will launch applications itself and automate any windows program. Thus, you'll get a fully automated software test which can enclose other testing tools as well. AutoClickExtreme functions as a scheduler. So, you can schedule automated tests at any time! You can also use "hot keys" for your automated software tests to run a test with a key stroke. You can edit any of the recorded actions in tests manually, you can also insert pauses before actions, copy/paste an action. You can automate not only software testing, but any other task as well. Any Windows program can be automated with AutoClickExtreme. Photoshop, Excel, Word, the whole Internet ... will be under your control! Download AutoClickExtreme free of charge here. During the free trial period, which is 41 days, you can use the simple view and the professional view of the program. Even when the trial time expires, the simple view is still available. You will get professional support concerning AutoClickExtreme automated software tests and any other AutoClickExtreme work automation. If you have any questions about AutoClickExtreme, feel free to email us at admin@autoclickextreme.com. We are always happy to help you! P. S. AutoClickExtreme will avoid all the errors that we are all prone to make if tired after multiple repetitions. It will not skip any tests and, moreover, it will record the test results accurately. It tests software with a randomness that can be compared only with manual testing, it will reproduce tests in varied situations to find bugs. P. P. S. With AutoClickExtreme you can start test automation whenever you like, and, if it's a late start, you don't have to change anything in code or strategy. You'll get automated software tests by recording the actions you've performed for ages. You get a quality software testing tool at a very low cost - $49!